After a post on the Barrow Media Center Facebook page that simply described a wish to have a LFL, teacher Sara Cross jumped on board to make this project happen in 5th grade. Art teacher, Rita Foretich, along with her student teacher took a huge leadership role in creating multiple jobs for students, using Google sketchup to design libraries, and committing to painting the libraries in art. Co-founder Rick Brooks took time out of his busy schedule to skype with our students to answer their questions and encourage them on their project. Students in 5th grade wrote persuasive letters to multiple places which resulted in Lay Park becoming our 2nd location and Home Depot built and donated the 2 libraries and paint. Students in 5th grade encouraged students in the whole school to donate books which resulted in about 18 boxes of used books to fill the libraries. Other incredible supporters like Barrow grandparent, Camilla Bracewell, donated money to support the registration of the libraries and additional supply & book purchases. Our move into our new school delayed our installation a bit. Mrs. Foretich kept the libraries over the summer and gave them some coats of clear coat to protect them from the weather. Her husband also spent time making sure that the doors on the libraries opened smoothly after getting a bit sticky from the clear coat. We entered this year with one big final step: installation. I should have known that once again our community would step up to support this project. Susan Henderson, librarian at Fowler Drive, suggested that her neighbor Chase Cook, who is a Barrow parent, would be a good person to contact. She even took time to ask him herself. Chase was more than happy to help. Another Barrow parent, Chris Adams, was suggested, and without hesitation he also agreed to help. I was amazed that two parents who weren’t even involved in the project along the way were so willing to step up and offer their talents and service to this project. Chase and Chris spent a hot Friday afternoon digging the holes at Barrow and Lay Park and installing both libraries. I can’t thank them enough for their time and hard work. 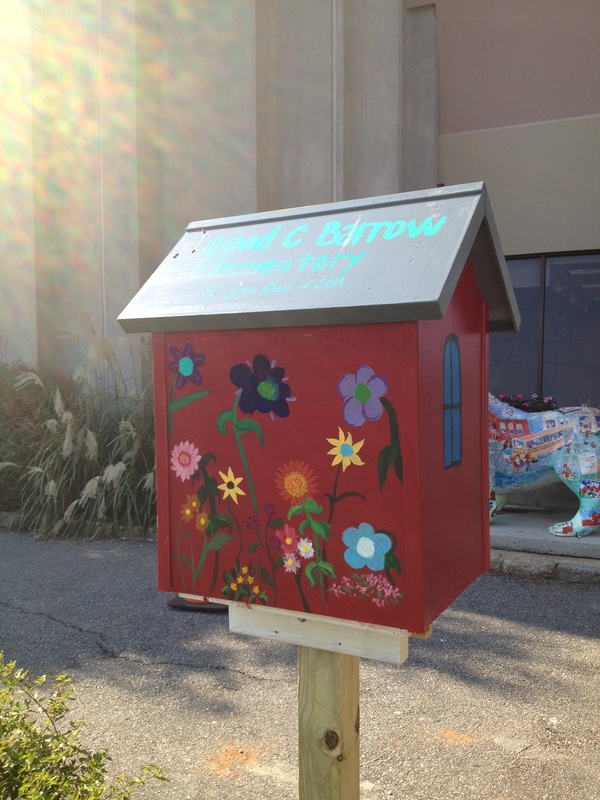 On Sunday September 8, I filled the Barrow Little Free Library with books. The Barrow library features our school theme of “Where am I in the world?” You’ll find the tree that owns itself, Georgia peaches and peanuts, the GA flag & US flag, and GA football. This week on our morning news show, I showed a video to all students explaining what this new mysterious box was all about. The afternoon after the video was shown was a busy time for our library and it was almost empty that day as students were eager to take home a book. We’ve already had to refill it once. On Monday September 9, Randy Haygood opened the Lay Park Little Free Library. This library features an old Barrow school look. A giant sun radiates from the roof and the back features a beautiful flower garden. I delivered 6 boxes of books to him so that he would have books to refill the library for a few weeks. 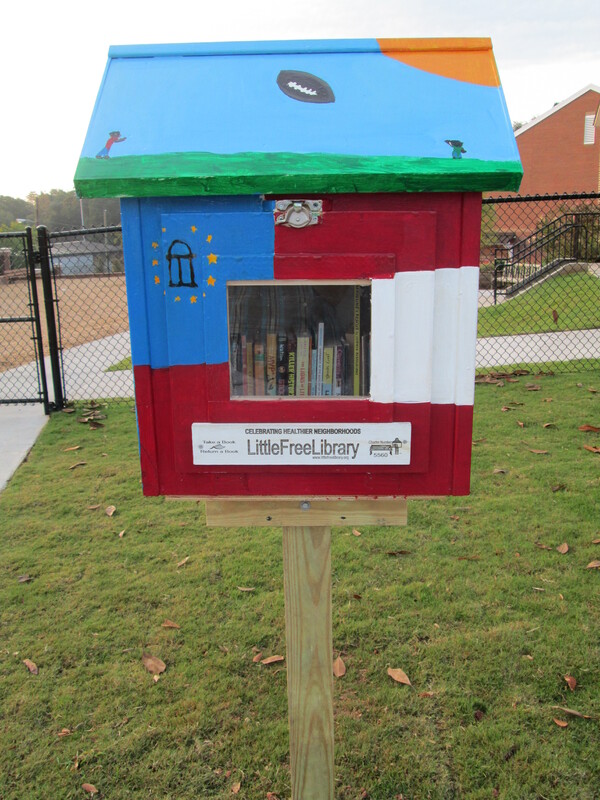 I can’t wait to see how this little library supports reading at Lay Park and the surrounding communities. These libraries are truly a gift. They represent so many voices, ideas, and creativity from students, parents, grandparents, and our community. Thank you Athens community for supporting this project. Enjoy these libraries for years to come. 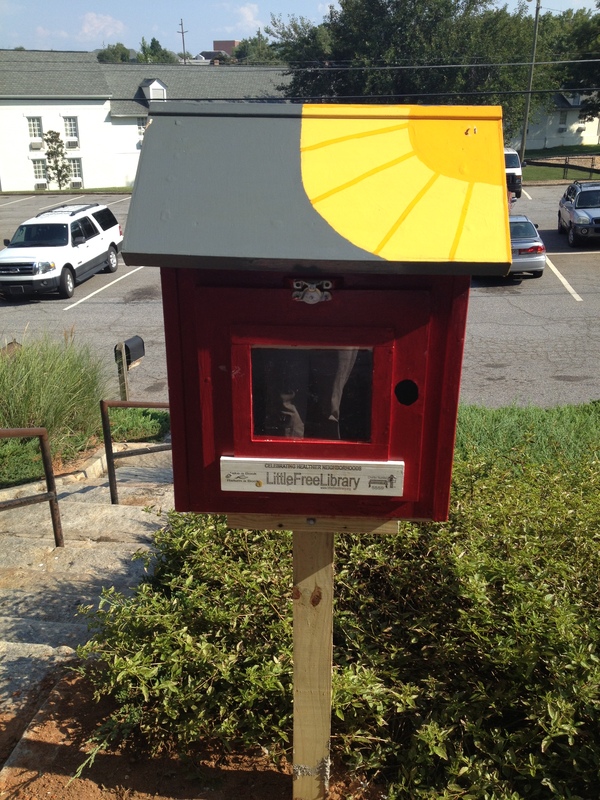 This entry was posted in Art, Library and tagged access, community, community involvement, little free library, reading, support. What a wonderful project! 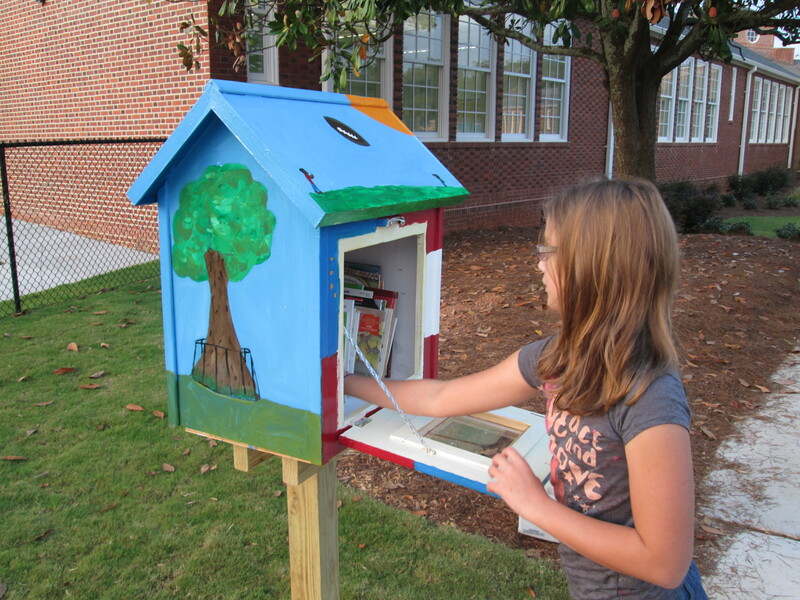 I LOVE the concept behind the Little Free Libraries. Best of luck to you and your students–you are truly helping them to become lifelong readers! Thank you for sharing. It is so much fun to see kids getting books out. The Lay Park Library has already been refilled 4 times!